Specially Formulated for Your "Working Class" Hero! Does my dog need Electrolytes? 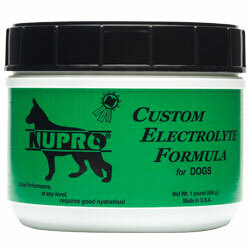 NUPRO® Custom Electrolytes for Dogs, a supplemental specialty product designed especially for highly active "Working" or "Performance Dogs", is formulated using balanced ratios of the purest quality natural Trace Minerals that are essential for optimal health and performance during stressful conditions. An integral component of the "working" dog's nutritional/training program, electrolytes are useful in aiding your dog's body to sustain, replenish and re-establish the normal fluid balances of blood and tissues which may be upset during periods of high-level stress and/or demanding competition and to continually maintain your "active" dog in First Class Health! Extremely effective in warmer climates and on hot summer days. Calcium (Ca) min 189 mg.
Calcium (Ca) max 210 mg.
Potassium (K) min 431 mg. Sodium (Na) min 473 mg.
Chloride (Cl) min 903 mg.
Magnesium (Mg) min 21 mg. THE NIGHT BEFORE A STRESSFUL EVENT: Mix required amount into dog’s water or food. EVENT DAY: Mix into dog’s water or food before and after any strenuous activity or exercise to support normal hydration. MAINTENANCE: High activity and working dogs require a minimum of twice-a-week dosing to maintain healthy and normal fluid balance in the body tissues.